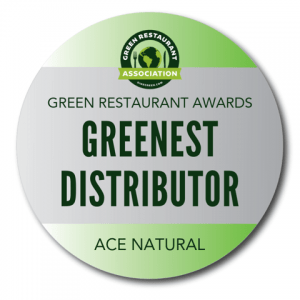 Ace Awarded Country’s Greenest Distributor! Hi, Alberto. Congratulations! The GRA mentioned that Ace has on-site solar panels, purchases RECs, and uses biodiesel trucks in order to tread lightly on the environment. Are any of these measures recent? Can you tell us a little bit about the journey to implementing each of them? Yes, these are recent measures. We are committed to continuing to be the greenest distributor in the country. Aside from hybrid-electric trucks, biodiesel, and renewable energy, we have a full composting program. We use state-of-the-art liquid food composting technology to make sure that we do not send any organic material to the landfill. The outcome of this machine is so clean that it can be used as organic fertilizer or go directly into the city’s drain system. We also have a robust recycling program and many other cool initiatives. Are there other ways that Ace works to be the greenest distributor? Ace Natural has been a carbon neutral company since 2016, certified by Co2Logic. In my opinion, this is a big deal. We reduce most of our carbon footprint through our sustainable operation and the Co2 that we generate is offset by supporting ecological projects abroad. In other words, we tax ourselves for our carbon footprint generation. By the way, I think we should have a carbon tax federal law in this country, but until then we depend on private initiatives. That is why Ace Natural is at the forefront of carbon neutrality for food distribution businesses in the U.S. It is hard for me to say. I guess it comes from my drive to live a synchronized life. I am somehow obsessed with efficiency and I always try to find innovative ways to keep raising the bar for our business. I also love it when other organizations try emulating what we do, so there is a ripple effect that benefits us all. What are some of Ace’s long-term goals, in terms of protecting the environment? We recently relocated our entire business to Mount Vernon, NY and we are about to start building a microgrid project for this new Westchester location. A microgrid is a system of solar panels, batteries, and a clean power generator working together as a seamless system so that Ace Natural becomes completely energy-independent. We won’t need to use any energy from the grid. In fact, we will actually be able to sell energy to the grid at the times when energy is in higher demand. This is an awesome project that will require an investment close to $1.5M. The plan is to start the project sometime before the end of this year. Ace Is Still In — Are You?